The behavior of audio playback in UE3 is defined within SoundCues. 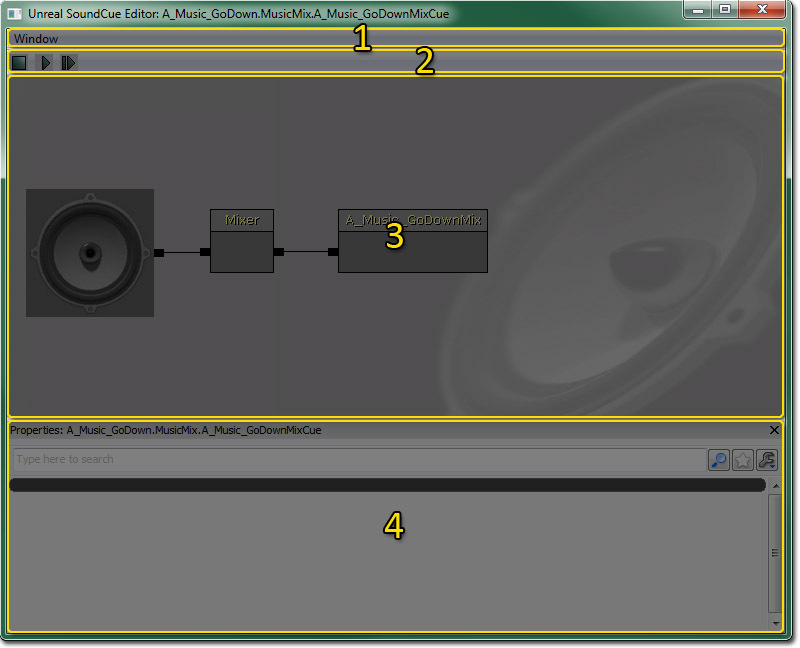 The Sound Cue Editor is the tool used to work with audio in the Unreal Engine. For explanations of the nodes available for use within the Sound Cue Editor, see the Sound Cue Reference. The Sound Cue Editor can be opened through the right-click context menu of a sound cue asset in the Content Browser. Selecting Edit Using Sound Cue Editor will open up that particular sound cue asset in the Sound Cue Editor for editing. Properties - Toggles display of the Properties Pane. Stops playing the sound cue. Plays only the currently selected node in the Audio Node Graph. Plays the entire sound cue. This interface displays the audio signal path from right to left with interconnected block Nodes representing audio control modules and audio files. Virtual patch cables are used to complete the signal patch by connecting the modules in any order or combination. The Speaker icon represents the final output of audio as heard in-game and is always positioned furthest left in signal path. The source audio files (Sound Node Wave) are always positioned furthest right in the signal path. To preview playback use the play buttons located at the top of editor window, the single arrow plays the source Sound Node Wave and the double arrow plays the SoundCues final output. The various audio Nodes can be added by right clicking anywhere in the SoundCue Editors window and selecting desired Node. The arrangement created in the SoundCue Editor is saved as a SoundCue. The Speaker icon in the SoundCue Editor is the Speaker Node. Clicking on it exposes the Cue Volume + Pitch settings which are used to manage relative Cue volumes. This affects the output of all audio contained within the Cue, if multiple Sound Node Waves are utilized with Mixer or Random Nodes, independent volume and pitch control can be accomplished per layer by adding Modulator Nodes. In the Content Browser use filter to make sure SoundCues are visible. Select Import button at the bottom left corner of the Content Browser or Import at the top of the context menu that appears on right-clicking the empty space in the Content Browser. The Import dialog opens; locate audio files for importing and select Open to add files. Package - name of package. Group - name of group, groups are used for organization and batch control. Name - name of the audio file. 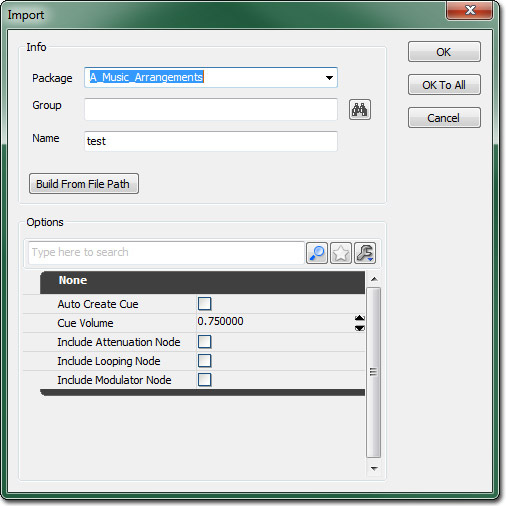 Auto Create Cue - if checked import will auto create a SoundCue per audio file. Cue Volume - this sets the Speaker Nodes Cue volume. Include [Attenuation / Looping / Modulator] Node - if checked import will auto create a SoundCue per file with [Attenuation / Looping / Modulator] Nodes. Select OK to adjust properties on individual files upon import; or select OK to All to apply current properties to all imported SoundCues. Sound Cues can be created in the Content Browser by clicking the New button and choosing SoundCue from the Factory dropdown list in the New dialog or by right-clicking in the Content Browser and choosing New SoundCue. Performing one of these actions will present you with the New object dialog where you can enter a package, group, and name for the new SoundCue asset. Once the new SoundCue asset has been created, you can navigate to it in the Content Browser and then right-click it and choose Edit Using Sound Cue Editor to begin editing the SoundCue.